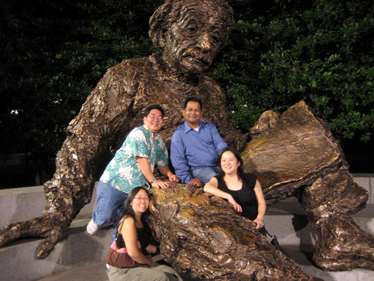 Reporter Craig Gima, top left, posed in Albert Einstein's lap at the memorial in Washington, D.C. Also pictured, clockwise, are Rocky Agrawal, Christine Chen and Doris Troung. WASHINGTON » Just around the corner from the monuments to our nation's great leaders and war dead is a relatively small sculpture and garden dedicated to a brilliant mind -- Albert Einstein. Unlike the nearby Lincoln Memorial and Korean War Memorial, it's not a solemn place that inspires reflection on sacrifice and freedom. Instead, the Einstein memorial is a place of discovery and fun. You can't sit on Lincoln's lap, but you can sit on Einstein ... and even give him a kiss on the cheek. The memorial is designed to remind us of the impact one man can have on science and the importance of science to the nation. But kids climbing on it and posing for pictures is "a wonderful hands- and 'feet-on' experience we hope will keep them excited about science," Ralph Cicirone, the president of the National Academy of Science said last year when the memorial was re-opened after a restoration project. Of course, it's not just kids who sit on Einstein's lap. The memorial is tucked away on the southwest corner of the National Academy of Sciences building on Constitution Avenue near 22nd Avenue. There's a sign that marks its location, but its location in a grove of elm and holly trees keeps it from being visible from the street. A 12-foot tall, 4-ton statue depicts Einstein sitting on three semicircular steps made of white granite. In his left hand, Einstein holds a paper with mathematical equations summarizing three of Einstein's most important formulas -- the photoelectric effect, the theory of relativity and, of course, E=MC2 -- the equivalence of energy and matter. If the bronze statue has a familiar look, it's because it was designed by Robert Berkes, who also cast the John F. Kennedy bust at the Kennedy Center. "Joy and amazement of the beauty and grandeur of this world of which man can just form a faint notion." At Einstein's feet is a map of the stars with 2,700 metal studs representing the sun, moon, planets and other celestial objects accurately positioned by astronomers from the U.S. Naval Observatory as they were at noon on April 22, 1979, the day the statue was dedicated. Look for the Milky Way and other galaxies at Einsten's feet. Stand at the center of the universe facing Einstein and think of what you would say to the man who changed how we think about how the world works. Then start a conversation. There's an echo effect that only you can hear. What would you tell Einstein? "You're quite massive. How much energy did it take to build you?" "Thanks for your time. It's been enlightening." Or, if you're like me, just "Hi, how are you?" A great mind, I am not.